A massive recovery operation is under way in Vietnam following devastating floods that killed about 50 people. 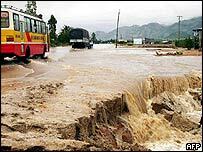 Provinces in the centre and the south of the country were hit by torrential rain and landslides, which destroyed thousands of homes and roads. Thousands of police and soldiers have been trying to reach isolated communities by helicopter and boat. Forecasters have warned of more bad weather, with a tropical storm due to hit Vietnam in the next few days. The massive downpours hammered parts of Vietnam on Wednesday and Thursday, causing rivers to burst their banks and cutting off several villages. Fifteen gold miners were among the dead, buried alive when their makeshift huts were swamped by a landslide in Quang Nam province. The deluge also crippled transport, cutting off the south trans-Vietnam rail link and the north-south Highway One. Officials put the cost of the damage at $28 million. As the waters receded on Saturday, thousands of police and soldiers were sent to affected areas to reinforce river banks and evacuate residents. It is the second time in recent weeks that Vietnam has been hit by torrential floods, and forecasters say more bad weather is to come. "We are all very tired now, but we are not allowed to relax because another storm is threatening to hit the area. We are getting ready for a new fight," an official from Ninh Thuan province told AFP news agency. Tropical storm Nepartak, which pounded central Philippines on Friday, is expected to sweep across Vietnam early next week.